This project was a collaboration between the Sea Turtle Conservancy (STC),where I worked as the Field Coordinator, and the Área de Conservación Tortuguero (ACTo) - Sinac in Tortuguero, Costa Rica. All beach images were taken under a permit provided by ACTo and the use of white lights or flash was not permitted. Tortuguero beach is an 18-mile stretch that is considered among the most important sea turtle nesting beaches in the world. With nesting numbers reaching nearly 200,000 in some years, the health of this beach is vital to maintaining the Atlantic green turtle population. Research started by STC and Dr. Archie Carr in 1959 was used to inform national authorities of the importance of Tortuguero which lead to it becoming a national park in 1975 protecting nesting females. Since research began in 1959 the nesting population has rebounded over 400%. A portion of all sales from images of this project will be donated to the Sea Turtle Conservancy to directly support sea turtle conservation. 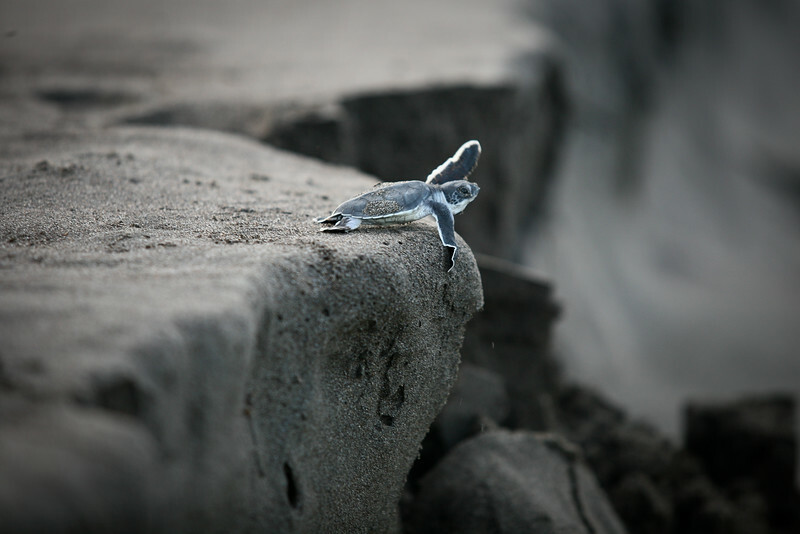 Tortuguero, Costa Rica, 2010: A green turtle hatchling takes a leap of faith on her journey to sea.